This week, on our travels, we are are coming up roses as we share two favourite eating spots we return to again and again. Rosamunde's Sausage Grill and Rose's Cafe could not be more different but we love them both, just about equally. Rose's Cafe, on the end of Union Street in upmarket Cow Hollow first lured us in a few years ago with a tempting thin crust brunch pizza topped with a gloopy-yolked egg, ribbons of prosciutto and a scent of truffle oil. Although we don't feel overly at ease with the smart, well-dressed, perfectly-coiffeured Ladies-Who-Lunch crowd, the "oh my god" Marinaesques or the sometimes boozy business associates who populate this sunny corner spot in the hours after midday, we distance ourselves, when we can, by electing to sit outside on one of the sidewalk tables. Last week we even peacefully lunched there in the drizzling rain. The bright yellow awnings are deep and robust which makes year round dining perfectly possible, especially with the heat lamps to help when the air is more chill. Those pizzas, delicious by the way, are available on the lunch menu priced from $13 (watch out for the luxurious extra toppings - they soon add up). Other choices include pastas and salads. We love their unique sandwiches called a cosy which are a homemade sesame-crusted pocket described as a housemade pitta but tasting more like pizza dough and then stuffed with an exotic filling. These days we are usually most tempted by the appetizers which make for a lighter and less expensive lunch. Less expensive doesn't necessarily come cheap, however. On our last visit, a bruschetta smothered in a saucy porcini ragu with one of the freshest poached eggs imagineable languishing on the surface, was a special treat. It cost $10 so, delicious as it tasted, it's not a lunch we could justify affording to eat every day. Rosamunde's Sausage Grill, on the other hand, is a place that favours your wallet as much as your tastebuds. 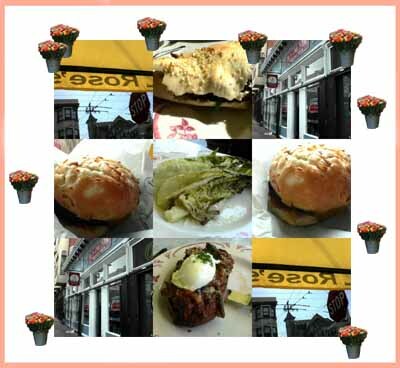 It's hard to believe that there are any San Franciscan's who haven't yet made the pilgrimage over to the lower Haight, so if you haven't put Rosamunde's on your list of places to try make sure you take note. The menu is simple and frilless, just your choice of grilled sausage on a toasted bun with onions, peppers, chili or sauerkraut and mustard (the wasabi is our particular favourite). There is a style of sausage to suit almost every taste including more unusual varieties like duck and merguez. Being a fan of the thin sausage ourselves, we usually opt for the Bratwurst which comes as a double meat hit. PS The most informative and fascinaing post I have read in a long time: Mince Pies with the meat here. I was so nostalgic about the breakfasts I used to have at Rose's Cafe that I was inspired to make a meal to remember them by--I just posted it yesterday. I really miss that place! On another note, I have to tell you that from last August's Dine and Dish you hosted--Rachel Ray for a Day--someone read my post and a rumor went around for a whole week that Rachel Ray had actually visited Syracuse! LOL! here is the link to Jennifer's refernce about Rose's. And that is just TOO funny about Ms Ray. She was in SF on Wednesday but I had to miss her because I was at David Lebovit's chocolate class. It's wonderful to see you spotlight Rosamunde's! I'm lucky enough to live 3 doors down from it, in a neighborhood so crammed with reasonably-priced wonderful restaurants as to drive me out of the kitchen some days (which is saying a lot!). I'm vegetarian so I don't get to try all of the wondrous varieties they offer, but their vegan sausage is a damn good nosh, indeed. Half the allure is those buns, anyway, for me.